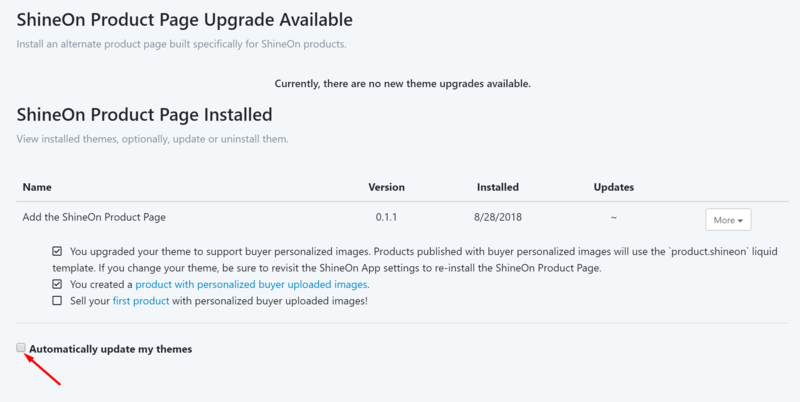 We're drawing closer to releasing a major update to the ShineOn Product Page, which sellers currently use for all products that have engraving upsells or Buyer Upload features. One crucial thing that this update brings is a new product page layout, with new style of variant selectors and customer inputs. Because of these changes, all previous CSS options you have set in "Additional Content (left/right)" sections will be reset in this update. We didn't make this decision easily, but the changes are too substantial to allow previous styling settings to carry over. If you make use of extensive styling changes using this options field, you may want to disable auto-update on the app Setup menu, to allow you to migrate to the new product page update in your own time and make any changes necessary.